There are two great hams from Spain: jamón serrano, made from the Spanish white pigs, cerdo blanco, and jamón ibérico, made from the dark Iberian pig, cerdo ibérico. (For those who haven’t studied Spanish, jamón, pronounced hah-MONE, means ham.) Both hams are salted and air-cured, not smoked. At a dinner Wednesday at New York City’s La Fonda del Sol restaurant, we enjoyed the most outstanding Serrano ham ever, in an all-serrano dinner (an outstanding creative menu by Chef Josh DeChellis and team). The serrano ham served was not just any serrano ham, but ham produced by a member of Spain’s relatively young Consorcio Serrano. A consorcio (con-SOAR-see-oh) is an association of producers of a particular product. Its purpose is to maintain the highest standards of quality, and to ensure that any product bearing the consorcio’s seal has passed the exacting review of expert inspectors. The world’s most expensive ham sandwich? Photo courtesy Jezalin’s Gourmet Market. The fine hams that get the seal of approval are worth seeking out. In addition to a hang-tag, the Consorcio’s stamp is applied to each approved ham. So if the ham is fresh-sliced for you, ask to see the S-shaped seal. Don’t believe a retailer who tells you that the seal has been carved off, or that a non-Consorcio ham is just as good. Not all serrano hams are Consorcio-approved. Some don’t pass the test, others are made outside of Spain, with less attention to the artisan techniques and authentic serrano flavor. “Serrano” means mountain dweller, by the way; the hams are made by “serranos” in the mountainous areas of Spain, and dry in the fresh mountain air. Learn more about serrano ham. While almost everyone can afford a slice of serrano ham, the more limited-production ham in Spain is jamón ibérico. The black Iberian pigs have black feet (pata negra), and the ham is often called by this nickname. These pigs are raised only in the west/southwest area of Spain, where the breed originated. The diet is very specific; there are three levels of jamón ibérico. The top-of-the-line pigs forage in the acorn forests to become even more flavorful before harvest (bellota ham has been called the finest ham in the world). You can read more about jamón ibérico here. 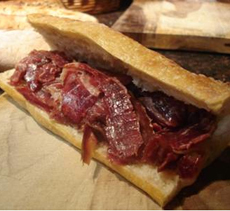 Jezalin’s Gourmet Market at Limelight Marketplace in New York City is now serving the “Conquistador,” a $39.95 ham sandwich, made of the top-of-the-line acorn-fed pigs, jamón ibérico de bellota. The sandwich is served plain on a baguette so as to not interfere with the ham’s flavor; but the Spanish would eat it in plain slices from the plate, which is truly the best way to savor each slice. LaTienda.com sells the same ham online: $49.95 for four ounces. Those in the chips can buy the entire bone-in ham for $1,395.00, or $96.00/pound (it does come with free shipping). This is a bargain compared to Jezalin, which sells the ham for $150/pound. Bellotta ham is delicious, but like a kobe beef burger, to our palate it isn’t worth breaking the piggy bank. For us: $20 or so a pound for Consorcio serrano ham hits the spot. The ham slices are light as a feather, so one pound buys a nice amount for a couple of ham lovers or a first course at a dinner party.